Now add waitlist or enrollment by day of the week. Export and downolad CSV files for Excel import for more reports. Build email distribution list for sending targeted messages to certain groups at you child care center like ‘waitlisted’ or ‘toddlers alumni’, etc. Weekdays detail report with copy and paste to Excel. Click ‘Select Table’ and paste into Excel or OpenOffice. Fixed tables to remember previous filters for ‘Enrolled’ and ‘Applied’ views. Bulk transition children from one classroom to the next. This is like moving a bunch of emails in Microsoft Outlook. Updates to hidden time machine report (in beta). Add fields to bulk CSV export from the reports menu. Shortcut for Birthdates – Instead of having to click the back arrow 36 time to put the D.O.B. for a child, you can now use the dropdown to simply change the year or month. Hopefully this will speed data entry for you and families. Extended ‘state’ saving to the ‘Applied’ table so that it remembers the last classroom you were viewing. 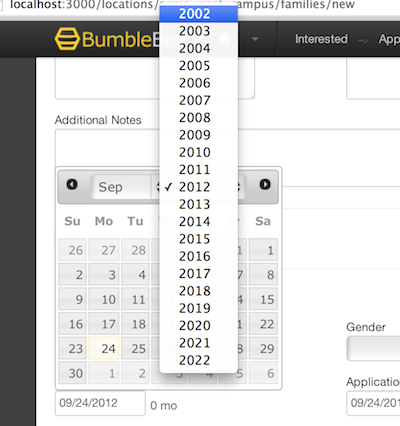 Now it’s even easier to enter birth dates! Emailing List Beta – We added a new report to the list. You may now create a filtered list of email address. You can then copy those emails to your email program like Outlook or Gmail. Either copy the whole table and place it in Excel or double-click on one of the column headers and past the list of address in your email program of choice. Easier Excel Export – There is a new button on the ‘Weekdays Detail’ report. From there you can copy and past the data into Excel. Also, we have replaced the Consumer reports style dots with the ones and zeros. This makes writing Excel formulas, should you choose to do so, a lot easier. Enrolled Students State Save – When viewing the enrolled students, and if you click on the classroom to see the currently enrolled children, the classroom filter will stay put the next time you come back. Assuming you did not come back via the handy classroom shortcut of a specific child.